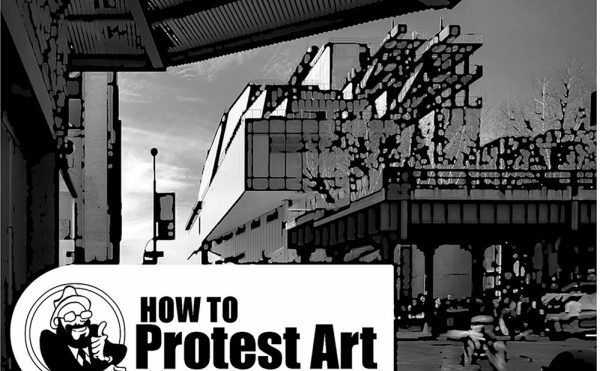 This week, artist studios in New York, Nova Scotia, Scotland, and Texas. 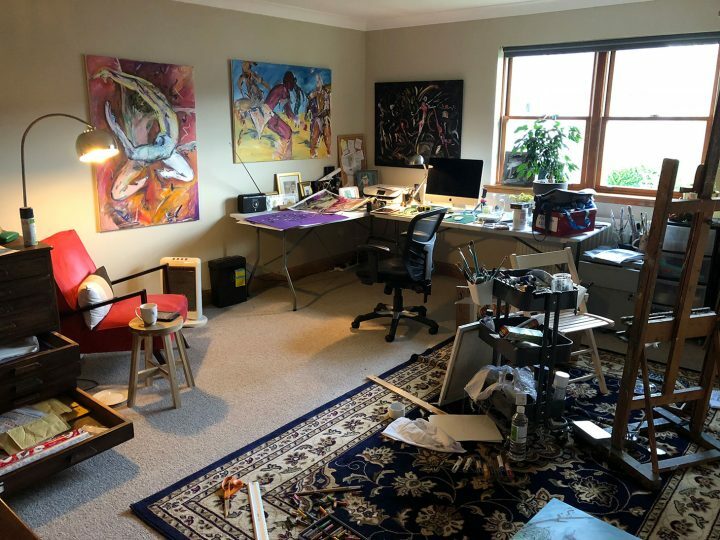 The 120th installment of a series in which artists send in a photo and a description of their workspace. Want to take part? Submit your studio — just check out the submission guidelines. 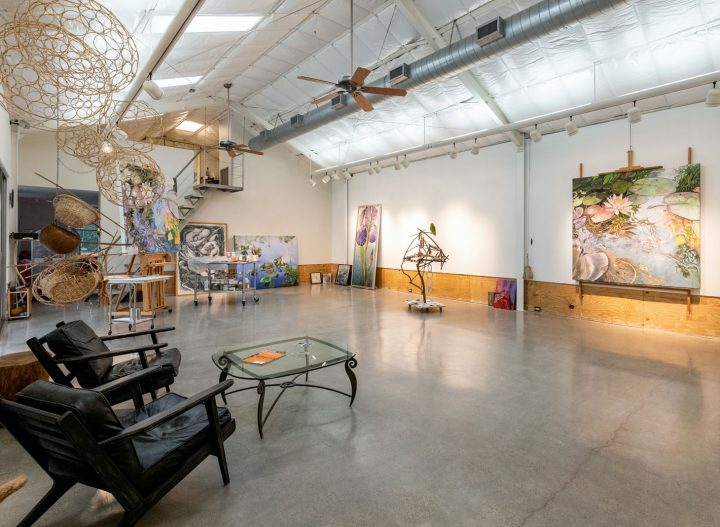 I built this studio in 1997 for a large scale public art project for Austin’s new airport terminal. When I say I built it, I mean me, with a hammer and nails, not a hired construction crew. 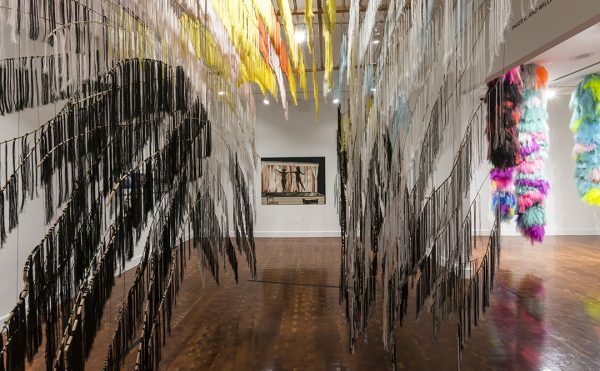 It is 24 by 36 feet, with a 16-foot ceiling. The building is a cross between a pole barn and a greenhouse, so can I rely mainly on natural light coming through fiberglass panels. I have always felt comfortable in basements. As a kid, I spent a lot of my time watching TV alone in the basement, in the dark. I made forts down there; I drew pictures. 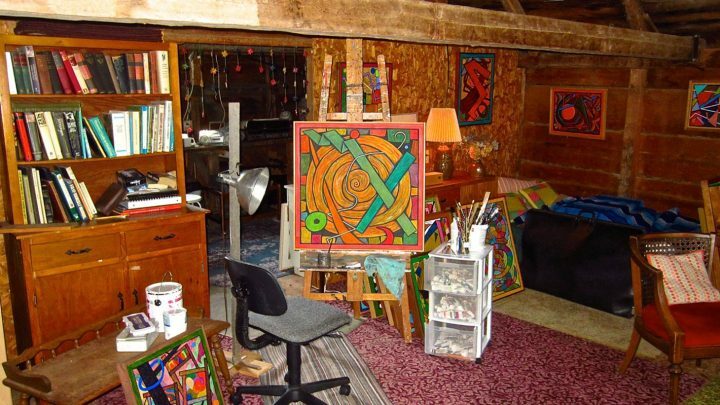 In college, I used that same basement from my childhood as my painting studio, and then when I went to grad school, the painting studios in the fine arts program were in the basement. I am used to working under artificial light, and I prefer it because it is easy to control, and it is consistent. When my wife and I bought our house in July of 2012, I knew the basement had potential for me to carve out a great space to make paintings. 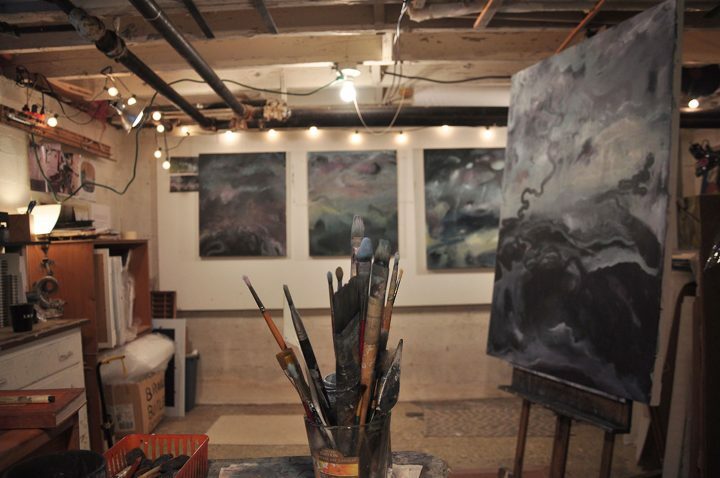 The studio is 230 square feet and has room for me to work on multiple paintings at once, storage space, and a sink. I built a four- by 12-foot wall for working on paintings on paper and mounted it to my concrete basement wall. 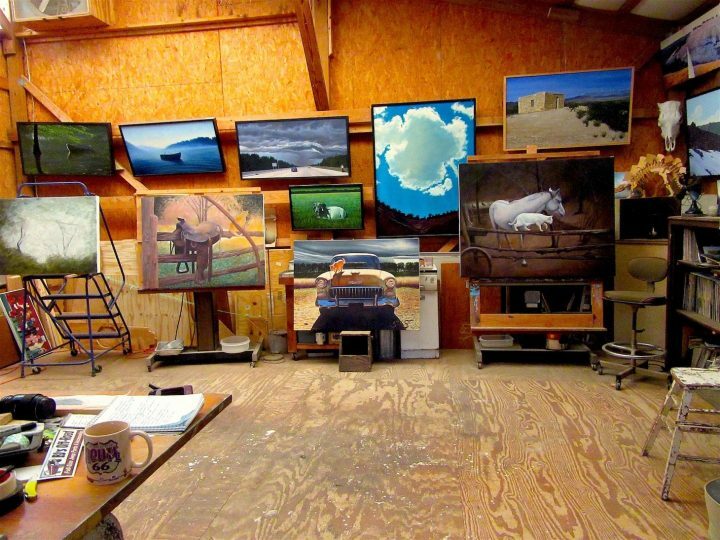 Lastly, working in a subterranean studio feeds into the imagery in my work. I tend to gravitate towards dark, muted colors, and the feeling of being underground inspires me every time I walk down those stairs to turn on the light. and Washington State Public Art collection. deconstructed site with all the amenities of a campground. But wild nature is still my muse — its mystery and primordial energy are intrinsic to my art. Resilience and perseverance are essential to being an artist and making a home. With kayaks tied to the porch, eaves and sandbags in reserve behind the garden shed, I am grateful to friends and collectors who are helping to re-build while I continue to work. From April to November, my studio is located in the loft of a barn that was hand-built around 1860 in Granville Ferry, Nova Scotia. In the winter, I move into a sun room located in my house just a few feet away. A skylight was installed in the roof of the barn, and a large open window with a sliding door that was once used to bring in hay allows allows plenty of northern light to stream in. There is plenty of room to store paintings, and in a room below I have tools I use to build stretcher bars for my canvases and framing. The south side looks out over the Annapolis River, and in the summer I get marvelous breezes blowing through. I even have a cot there, in case I need to nap. 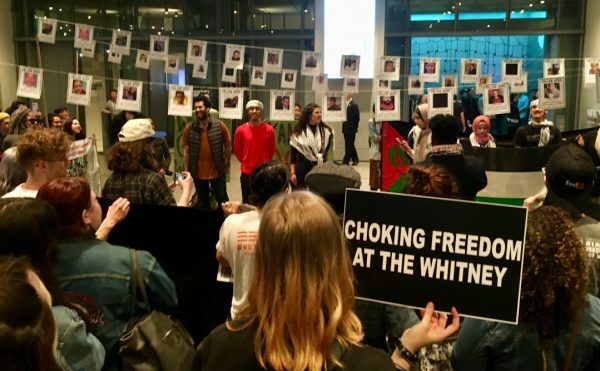 Occasionally, I gather in the space with other artists in the community to discuss our work and to view slide shows of modern and contemporary art. It’s an inspiring and contemplative place to be, and I spend hours there, listening to the sounds of nature coming from the mountains and fields around me. My studio is in a room in my home in Scotland. As you can see, I work on a number of projects at once and tend to spread out. My partner thinks I’m crazy because I don’t always close the drawers of my plan chest where I keep works on paper. The top on the chest is the right height to stand and work. Next to the chest is a reading chair where I often contemplate where I’m going next on a work, and it has a good view of what’s on the easel. (I have lunch here deciding what needs to be changed on the easel.) The tables make a good area to work on admin and paint. Most of my work happens on the easel or on the floor. I can let go with more abandonment here, and I have a rug over the carpet to protect the home flooring. It’s also warm, as tend to work barefoot.